ANdAL pAtti is reciting kaNNinuN chiRuth thAmbu prabandham. parAsara and vyAsa arrive there. vyAsa: pAtti! what are you reciting now? ANdAL pAtti: vyAsa! I am reciting kaNNinuN chiRtuth thAmbu which is part of dhivya prabandham. parAsara: pAtti! Isn’t this the one that was composed by madhurakavi AzhwAr? ANdAL pAtti: Yes. Very good memory. vyAsa: pAtti! While explaining the history of AzhwArs you told that each AzhwAr has composed some dhivya prabandhams. Please explain about dhivya prabandhams in detail pAtti. ANdAL pAtti: Sure vyAsa. That is very nice of you to have the interest to learn things in detail. Our srIranganAthan and srIranganAchiyAr are called as dhivya dhampathi (divine couple). AzhwArs are called as dhivya sUris (divine and auspicious personalities) because of them being blessed by bhagavAn. 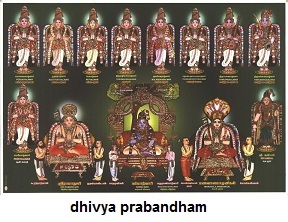 The pAsurams (slOkams in thamizh) that were composed by AzhwArs are called dhivya prabandham (divine literature). The kshEthrams that are glorified in dhivya prabandham by the AzhwArs are called as dhivya dhEsam (divine town). parAsara: Oh! that is very interesting pAtti. What are these dhivya prabandhams talking about pAtti? ANdAL pAtti: The main purpose of dhivya prabandham is to fully discuss the auspicious qualities of emperumAn. That too, specifically, archAvathAra emperumAn like our periya perumAL, thiruvEnkatamudaiyAn, etc. vyAsa: But we have heard that vEdham is very important for us pAtti. How is vEdham connected to dhivya prabandham? ANdAL pAtti: That is a good question. 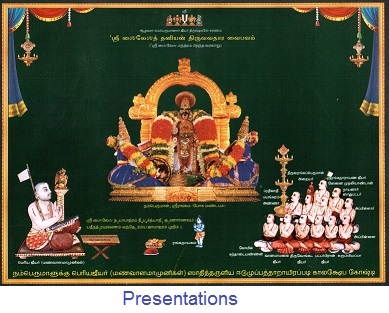 vEdham is the main source to know about perumAL. vEdhAntham, which is the top-most part of vEdham discusses in detail about perumAL, his divine qualities, philosophy, etc. But all of these are in samskrutham. AzhwArs brought out the essence of vEdham and vEdhAntham in their dhivya prabandhams in beautiful thamizh language. parAsara: Oh! But what is the difference between vEdham and dhivya prabandham pAtti? ANdAL pAtti: It is explained that, when bhagavAn descended from srIvaikuNtam to ayOdhyA as srIrAma, vEdham also appeared as srI rAmAyaNam. Similarly, when that same perumAL descended as archAvathAra emperumAn, vEdham appeared as dhivya prabandham through the words of AzhwArs. paramapadhanAthan is very difficult for us to comprehend from where we are now. So, we are approaching archAvathAra perumAL easily in our own place. Similarly, vEdham/vEdhAntham are difficult to comprehend. 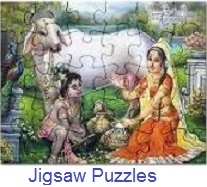 But the same principles are explained in a much simpler and crisper manner in dhivya prabandham by AzhwArs. vyAsa: pAtti! Does that mean vEdham is not important for us? ANdAL pAtti: No no! Both vEdham and dhivya prabandham are equally important for us. vEdham is important because it is the root of all sources to understand about perumAL. But for learning and enjoying the auspicious qualities of perumAL, dhivya prabandham is most apt. Also, the most complicated principles that are explained in vEdham, can be easily understood by studying the meanings of dhivya prabandham, with the help of the explanations given by our pUrvAchAryas. So, one should study vEdham, vEdhAntham and dhivya prabandham according to ones own situation. parAsara: What is the main focus of dhivya prabandham pAtti? ANdAL pAtti: The main focus of dhivya prabandham is to eliminate our engagement in temporary pleasure/pain in this material world and to elevate us to permanent and natural bliss in paramapadham by serving srI mahAlakshmi and srIman nArAyaNan eternally there. Our nature is to serve srIman nArAyaNan eternally, but due to us being in this world engaged in worldly activities, we are missing out on that valuable joy. dhivya prabandham highlights the importance of serving perumAL eternally in paramapadham. vyAsa: Yes pAtti! We understand that a little bit as you have previously explained this principle before. parAsara: Who are our pUrvAchAryas pAtti? ANdAL pAtti: parAsara! very nice question. I will explain you about the many AchAryas of our sampradhAyam from now onwards. It is very importance for us to know about our AchAryas in detail so that we can fully realize how they lived by the words of AzhwArs and the importance for us to follow in their foot steps. parAsara and vyAsa: Thanks pAtti! We are looking forward to hearing about our AchAryas. This entry was posted in Beginner's guide, Stories on February 23, 2015 by Sarathy Thothathri. ANdAL pAtti, parAsara and vyAsa are returning home from uRaiyUr. ANdAL pAtti: parAsara and vyAsa, looks like you had a wonderful time at uRaiyUr. parAsara and vyAsa: Yes, pAtti. It was so nice to see thiruppANAzhwAr there. We like going to dhivya dhEsams and worship the archAvathAra emperumAns there. ANdAL pAtti: I will now tell you about thirumangai AzhwAr who is instrumental in revealing the glories of so many dhivya dhEsams. He was born on kArthikai mAsam kArthikai nakshathram at thirukkuraiyalUr near thirunAngUr dhivya dhEsam. He composed 6 dhivya prabandhams namely periya thirumozhi, thirukkuRunthANdgam, thiruvezhkURRirukkai, siRiya thirumadal, periya thirumadal and thirunedunthANdagam. His original name was nIlan (since he was bluish colored). parAsara: How did he travel to the dhivya dhEsams those days pAtti? ANdAL pAtti: He had a horse named AdalmA which was so powerful and he used to travel everywhere in that horse. 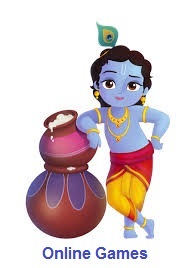 vyAsa: What are his specialities pAtti? 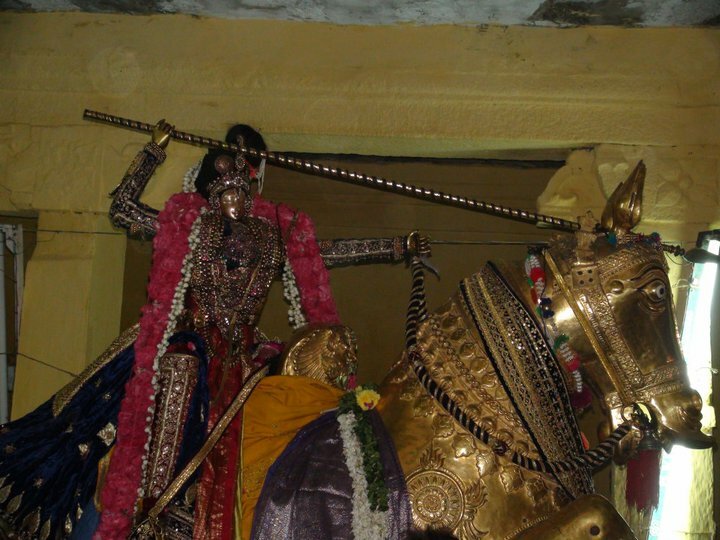 ANdAL pAtti: There are many unique aspects of thirumangai AzhwAr. Initially, he was a great fighter and was ruling over a small kingdom. At that time he meets kumudhavalli nAchiyAr and he wants to marry her. kumudhavalli nAchiyAr tells him that he will only marry a devotee of perumAL who also serves bhAgavathas with great care. 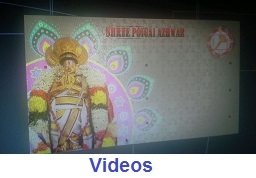 AzhwAr agrees and becomes a devotee of perumAL and thus they marry each other. 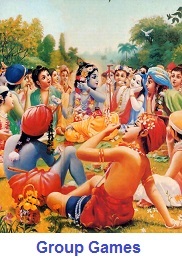 AzhwAr serves many srIvaishNavas by feeding them prasAdham. But eventually, he runs out of wealth to support that kainkaryam. So he starts robbing wealthy people who pass by the near by forest and uses that money in serving others. parAsara: Oh! can we steal pAtti? ANdAL pAtti: No! we should never do that. But since AzhwAr was so desperate to serve bhAgavathas, he started robbing wealthy people. Anyway, perumAL wanted to give full knowledge to him and reform him fully. So, he himself along with thAyAr, dresses like a newly married wealthy couple and travels in the same forest along with a grand family/relatives. AzhwAr sensing a good opportunity to earn some money, tries to rob them. But by perumAL‘s grace, he finally realizes that perumAL himself has arrived. perumAL blesses him fully and reforms him to be very pure. Since he tried to force perumAL himself to bless him, perumAL names him “kaliyan” which means very majestic/prideful. He is also known as parakAlan (one who is feared by supreme lord himself). vyAsa: Wow! this is amazing pAtti. What did he do after that. ANdAL pAtii: Being overwhelmed with great emotions, he fully surrendered to perumAL. After that, he travelled the length and breadth of bhAratha dhEsam visiting many dhivya dhEsams (over 80) and glorified the perumALs there. That too, he has exclusively sung about over 40 perumALs who were not sung by any other AzhwArs – thus revealing those dhivya dhEsams to us. parAsara: Oh! It is our great fortune – because of him, we are worshipping these dhivya dhEsams now. We will always be thankful to him. ANdAL pAtti: He also performed many kainkaryams in our srIrangam, building forts around the temple, etc. During his lifetime itself, perumAL orders AzhwAr‘s brother-in-law to make a vigraham of AzhwAr and worship the same. After some time, thirumangai AzhwAr goes to thirukkuRungudi dhivya dhEsam, spends some time there worshipping nambi emperumAn. Finally, meditating on emperumAn, he ascends to paramapadham to be engaged in kainkaryam to emperumAn eternally. vyAsa: We have understood the importance of kainkaryam to archAvathAra perumAL and his devotees from AzhwAr‘s life pAtti. ANdAL pAtti: Yes, that is the essence of our sampradhAyam. With this, you have heard about all the AzhwArs. I will tell you both about our AchAryas next time. parAsara and vyAsa: OK pAtti! We are eagerly waiting for that. This entry was posted in Beginner's guide, Stories on February 11, 2015 by Sarathy Thothathri.